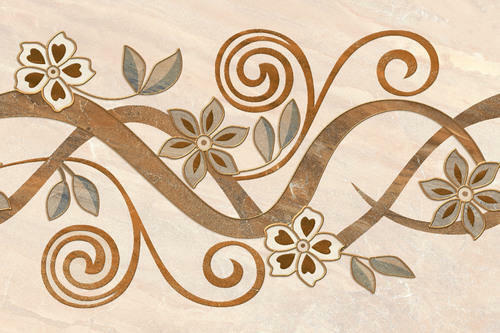 We are one of the leading organizations, engaged in offering high quality Decorative Ceramic Digital Wal Tile. This is widely demanded by homes, offices, commercial complexes and malls for wall-cladding, roofing and flooring. Further, we have qualified and experienced quality controllers, who check this marble rigorously to ensure flawlessness. ceramic wall tiles is most popular tiles using interior or exterior side. · Packaging Details: 4 PCS BOX PACKING WITH CORNER PROTECTOR. PALLET PACKING OF 40 BOX/PALLET. Standard exportworthy wooden Pallet Packing. Capability to ensure exquisite designs, appealing colors and alluring patterns in our products, Bluetone Impex LLP, established in 2013, have evolved as a leading manufacturer and exporter of Floor and wall Tiles. Suiting to the different needs of the tiles, our products include Soluble Salt Tile, Digital Porcelain Tile, Full Body Porcelain Tile, Digital Ceramic Wall Tile and Digital Ceramic Floor Tile. Trust, quality, reliability and inspired leadership have always been at the heart of the Bluetone Impex. Since its inception, the visionary founders have directed the company towards global competitiveness, technological advancement and high-quality production into turning the company into a world-class organization. Moreover, our customer-centric as well as quality- focused business policies have been enabled us to muster a large client-base in this competitive market. Our uncompromising attitude towards quality and excellence is displayed in our ever growing list of satisfied customers. To continue expanding our operations and client list, we have set up an integrated and fully advanced manufacturing facility. It is equipped with hi-tech and fully automated machines and technology to ensure latest trends in our products. All products designed and produced are individually tested and checked prior to every dispatch. The activities are manned by a team of talented engineers and skilled craftsmen who are experts in their domains. With a complete understanding of the business and products, they have helped us in capturing a sound share in the market.